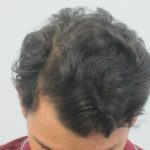 This share is about Mens Hair Loss Treatment for Early Onset Male Pattern Thinning in a 20-year-old student. Had just completed 2nd year university, understood diet and lifestyle needed to improve. Bloods showed highs and lows representing various organs, inflammation and absorption issues. Iron (ferritin) in particular was low for a male of this age. Discussion uncovered attempt to be vegetarian over the past 3 years, but was not doing it very well. Fear of the hair thinning had also resulted in start/stopping of commercial minoxidil and prescription medication to combat the hair loss. The problem here was there was never a correct diagnosis to begin with. 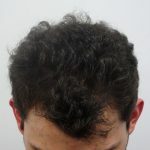 The actual cause was never address and the reactive behaviour actually triggered hair loss on top of the Early Onset Male Pattern Thinning. The hair and scalp was dry and the scalp was now also scaly. That is what commercial minoxidil generally does because of the common harmful ingredient propylene glycol. Absolique Trichologist focuses on correct diagnosis and avoids harmful ingredients. Our main aim was to stabilise the hair loss by working with the hair cycle and balance out the scalp environment. Cost was a factor to be considered. We shared how important good diet and good health are to healthy hair and that the pattern thinning is not hair loss, and should not be happening yet. It was happening because of poor health. pH testing, diet and lifestyle changes along with Absolique Basic Topical Hair Loss Treatment were put into a treatment plan for 4 months. Here are the results. As you can see, we have not just stabilised the hair loss but we have achieved some hair regrowth. All with simple changes. The scalp had improved immensely and we are tracking health through pH and blood tests. If you have any concerns about hair loss, hair thinning or your scalp, don’t go it alone and be careful what you read online. We have saved this young man’s hair because he sought out a correct diagnosis. Reach out to Absolique Hair Health Clinic with any questions or concerns about Mens Hair Loss Treatment and the many options now available. Call our helpful team on 07 3229 3242 of email info@absolique.com.au direct to Absolique Trichologist.